The youth at Texas Empowerment Academy are exposed to a culturally rich and dynamic curriculum throughout the school year. Extending their cultural knowledge through Fine Arts Programs that consist of Dance, Theatre, Band, Visual Arts, Karate and Technology is a top priority. Students become more interested in their subject matter. Daily attendance increases and students are more engaged in their daily classes. Underperforming students improve in all academic areas. Student/teacher relationships increase, making school fun. Behavioral referrals for students decrease. Dance uses an Interdisciplinary approach whereby students learn Modern Dance, Ballet, Jazz, African and Hip-Hop Dance. The dance program begins in the 3rd grade and continues through 9th grade. There is a rich history of African American artists. Youth learn about the history of dance and various genres including: African Dance, Modern, Ballet, Jazz and Hip-Hop Dance. Dance is a great outlet when youth are sad, angry, or confused. Dance requires youth to communicate and work in teams increasing their communication skills. Introverted students become more outgoing, outspoken, and confident. Students learn to be graceful, to respect their bodies and become more confident. Students learn to interact with and respect the space of their peers. Youth learn the importance of working together in team performances with classmates who may think differently. Beginning in the 6th grade, students are taught intermediate to advanced level Jazz with traditional jazz instruments (Trombone, trumpet, saxophone, guitar, bass guitar, drums and mallet percussion.) Students study music theory, as well as music appreciation by studying and playing different genres of music: classical, jazz, R&B, concert and rock and roll. Students perform in a band, small groups, solo and at times improvisation, which teaches them how to play and enables them to succeed as an artist both inside and outside of class. Students learn to read music; increasing academic scores in Reading and Math. Students have less behavioral referrals. Students learn the responsibility of taking care of an instrument. Students learn leadership skills by participating as section leaders; preparing and conducting warm-ups; leading in reviewing previous assignments and helping students that missed lessons. Band creates a family atmosphere were students unlock their ability to be emotionally vulnerable, where they trust the teacher and other classmates to share their home and environmental struggles. Our theater program is designed to nurture and inspire our young actors, utilizing individual and group theatrical performances. Students participate in one-act plays, skits, and musicals in Broadway-style productions. They learn the various components of theater including acting, stage blocking, lighting and sound, set design, makeup, costume design, business and house management. Youths are taught technical theater and are required to write 90% of their work. In addition, students are required to learn how to build a caricature, monologue, and scenes with 2-3 voices. Youths improve on memorization and confidence. Every student that joins theater states that “they can’t stand up in front of an audience and memorize so many words.” After their first performance, there is a new sense of confidence and accomplishment. Writing is a requirement for everyone, and complements their out of class writing with expressive writing, enabling students to step outside themselves and write scenes as if they were another person. Writing turns negative energy and feelings into creative energy, allowing them to be witty funny, emotional and to grow. Students learn how to be more articulate with word choice, voice projection, and self-expression. Students come from environments where they are on constant alert to their environment. Practicing improv in class enables students to make better creative and problem-solving decision. Visual Arts students learn the basic drawing techniques using a pencil and charcoal materials. In addition, the program instructs students in the use of paintings, sculpture, and pottery. This program begins in Kindergarten and continues through the 9th grade. Allows the teacher to identify learning disabilities through their artwork. There is not a lot of emotional stability at home, and Visual Arts support the emotional development of the students. More than 50% of the students are living at or below the poverty line. 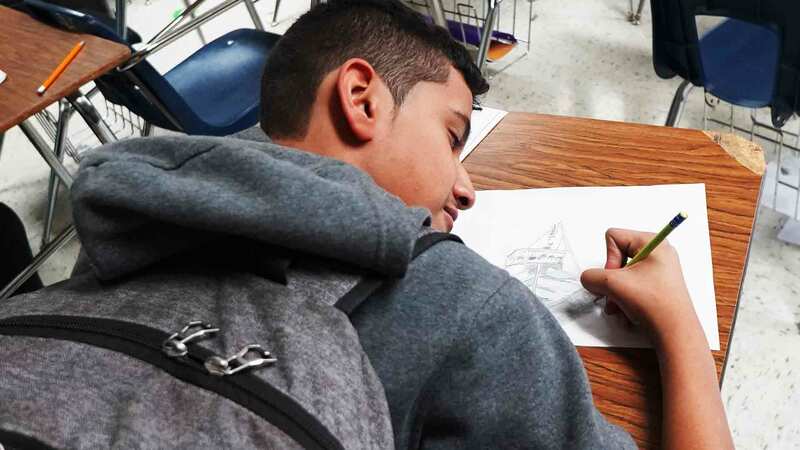 For some students, Visual arts is their only creative outlet. Students learn about various cultural genres with an emphasis on African American Art helping them to understand their identity and culture. Students learn how to better identify and define themselves rather than relying on what is featured in music and television. The technology program is designed to give students real-life experience in the careers of coding, film, photography, animation, and graphic design. All subject areas are heavily focused on entrepreneurship. This provides students with the knowledge of running a business, creating a budget, and marketing. The program also helps the students develop critical thinking and problem-solving skills using tools such as industry standard programs and classroom created scenarios.